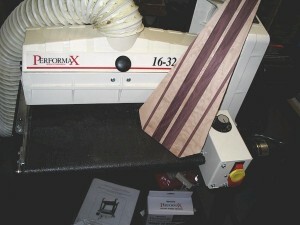 I’ve finally got one of my most sought-after stationary power tools: a drum sander. This sander has already sped up many laborious tasks in the first week I’ve used it. 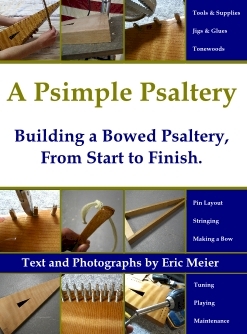 You can see an example of its work: a multi-piece striped bowed psaltery back. It is made of quilted maple and purpleheart. Now, I can just set the bowed psaltery back on the conveyor belt, and let the sander do all of the work for me within seconds, and with a much greater degree of accuracy than is possible with hand sanding.